-We have updated this post as of 8/17/18 to reflect updated information about permit availability/waitlists and permit mailout. The fall semester is about to start and we wanted to share a quick guide. 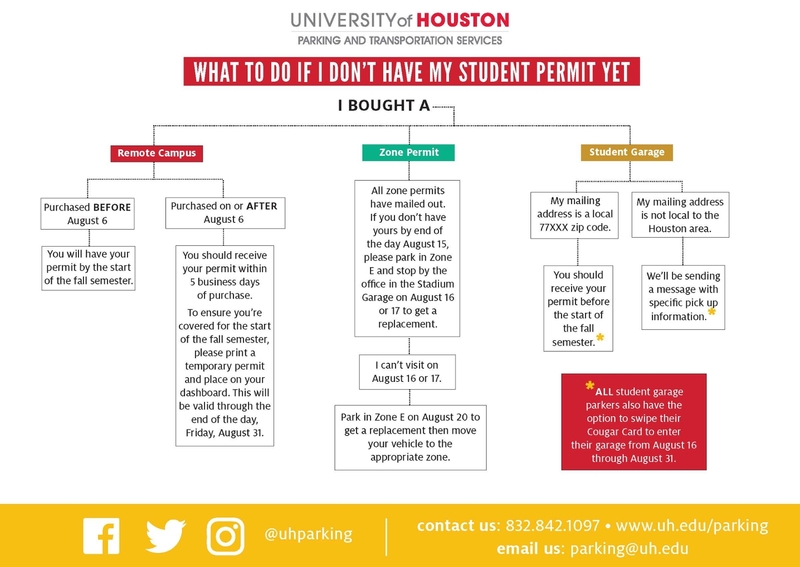 If you would like to park on campus and haven’t purchased a permit yet, we recommend going to AccessUH and signing up for the Remote Campus waitlist to be notified if/when more of these permits become available. Check out our other transportation options page for some helpful resources about alternative ways to get to campus. If you purchased a permit and haven't received it in the mail, please view our student permits mailout guide or faculty/staff permits mailout graphic for details about when to expect your permit and next steps. 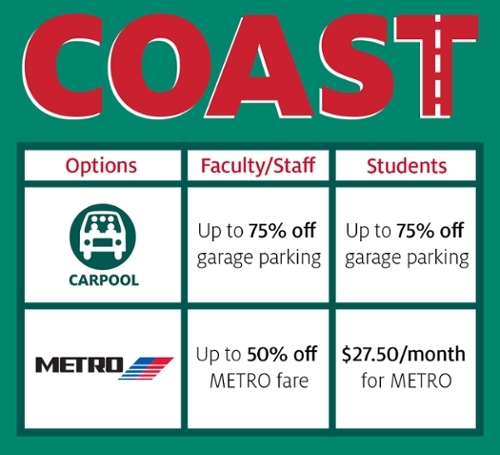 Instead of purchasing a permit, let Parking and Transportation pay for your METRO fare by joining COAST. We also have a limited number of permits left for COAST carpools, which would allow a carpool of three or more people to park in one of the garages at a discounted rate. Visit the COAST site for details. We’re now utilizing license plate enforcement to check vehicles for permits and ensure that they are parked in the correct location. It’s important that you make sure your license plate information in your myParking Account through AccessUH is up to date at all times. Although we’re using license plate enforcement, properly displayed permits are still required to park on campus at all times. View the parking map for your parking location and know your routes into campus. The first couple of weeks are hectic and campus experiences heavy traffic during that time. Be sure to allow extra time in your commute until things calm down. Also be aware of the construction impacts on and around campus. 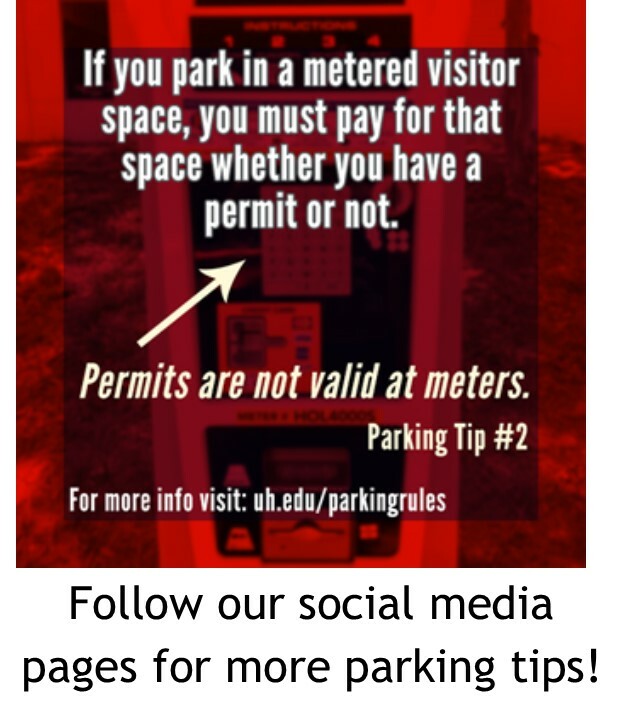 We recommend bookmarking the Campus Parking Map for reference of parking locations as well as our Traffic Alerts page. We encourage you to take advantage of our Cougar Line Shuttles to make traveling across campus easier! This year we have several new routes to accommodate zone parking and an improved shuttle tracking system so you can see when the next shuttle will arrive. Learn more on our Cougar Line Shuttles page. We want to help you avoid getting a citation on campus. 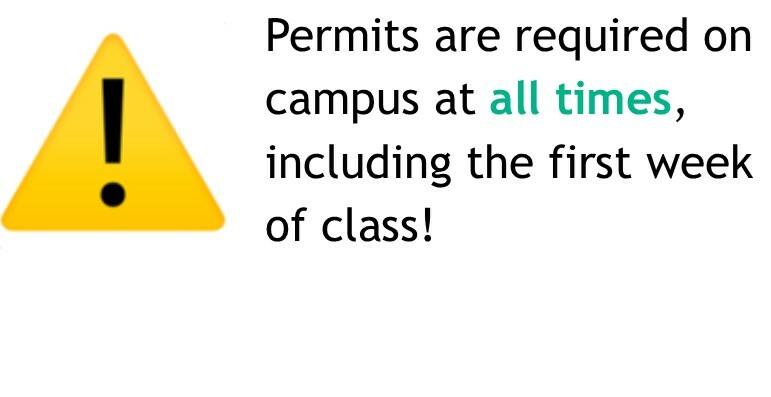 First of all, we want to stress that valid permits are required at all times to park on campus, including the first day of class. Those without a valid permit must use paid visitor parking. Below we have listed several tips to avoid common parking violations that people make. However, please review our Rules and Regulations page for more comprehensive information. Keep an eye out for us the first week of classes! Volunteers will be located throughout campus lots helping guide parkers to their correct parking area. 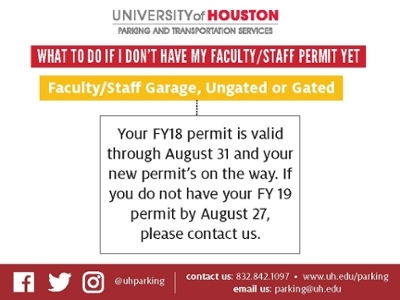 If you ever have any questions, please reach out to us at parking@uh.edu by calling 832-842-1097 or by messaging us on Facebook, Twitter or Instagram.